Kuwait – 15 October 2018:- Abdulmohsen Abdulaziz Al Babtain Co., the authorized agent of Renault in the State of Kuwait invites its fans to visit the showroom situated in Al Rai and experience the sporty Megane GT. A recent member of the Megane family, tuned by Renault Sport, boasts a 1.6L and TCE 205 HP engine mated to 7 speed dual clutch automatic gearbox, achieving a swift 0-100km/h in just 7.1 seconds. 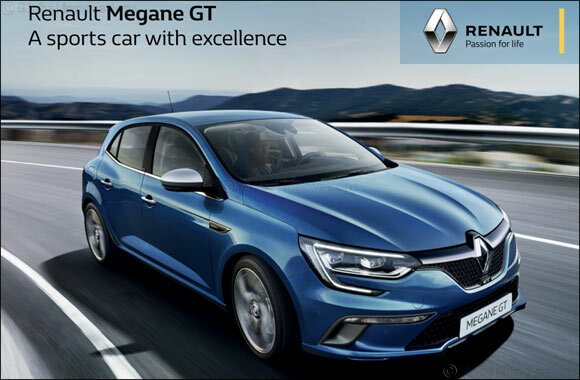 The Megane GT showcases an attractive sporty design, notably in the front grill and bumper, front C-shape DRL and full LED headlamps, and proudly wears the Renault Sport and GT logo on the front wings and at the rear. Rear LED tail lamp with distinctive 3D light effect and 18” GT MAGNY-COURS alloy wheels ensure the model stands out from a crowd. Combining dynamic style and ride comfort, the model offers first-class road handling thanks to 4CONTROL. The 4CONTROL chassis controls rear-wheel steering, delivering unprecedented and unrivalled driving experience. The model also boasts a GT Nappa leather steering wheel and GT style alloy pedals. Driver comfort and convenience are enhanced with features such as the multi-sense through four available options for engine performance, sound, steering and variable damping; Comfort Mode, Normal Mode, Sport Mode and Personal Mode. Each mode assures optimal convenience by allowing the driver to modifying the accelerator pedal and engine response, adjust the speed of the efficient dual clutch (EDC) gearshifts, and fine-tune the firmness of the steering and ambience of the cabin lighting. The model delivers a connected driving experience thanks to R-LINK 2, which serves as the car’s control centre. Showcased via a modern 8.7’ touchscreen, R-LINK 2 ensures an ‘Easy Life’ by offering a range of in-car features including easy park assist, rearview camera, Renault Smart Card with walk-away closing, as well as an active emergency braking system, 6 airbags or even the Renault Sport mode switch button: RS Drive. Engineers from Renault and Bose have collaborated closely to produce a tailor-engineered sound that has been specifically configured for the Megane GT. Thanks to the optimal positioning of a central loudspeaker at the front, eight further high-performance loudspeakers located around the cabin and a subwoofer built into the boot, the model generates sound that is precise, clear and well-balanced.